I was born in New England in the 1950’s and, like many of my peers, my earliest adventures with needle and thread were creating doll clothes. 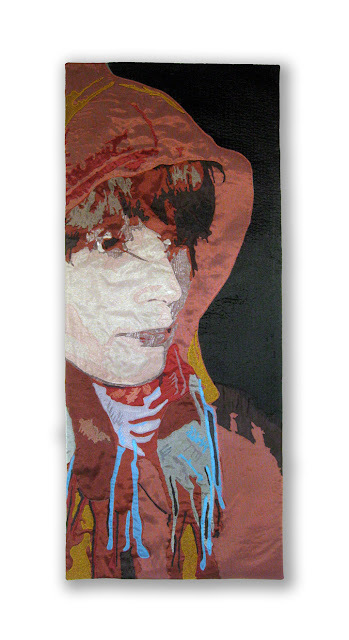 As a young adult, I studied printmaking at the School of Visual Arts in NYC and created soft sculptures and my first ”art quilts” in the 70’s. Following many years pre-empted by family and an academic career in marine science, I’ve returned to my artistic pursuits with clarity and commitment. Today, my artwork often originates from photographs, and is a synthesis of what I see and feel….sometimes literal, sometimes abstract. I’m fascinated by architectural elements, the untold histories in antique photos, and transitions in color, shadow and light. "just Harry", 18" x 45"